Although we expect our property to be respected, things don’t always go according to plan. In certain cases, you might find your car has been violated at your home or in a public parking lot. Spray paint may be one method used to deface the vehicle. 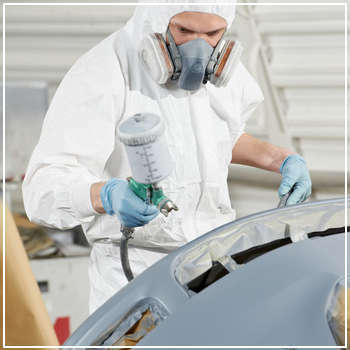 Catching the paint early may save your car’s finish but the longer it sits, the more work will be needed to remove it. What can you do? It sounds so simple, but there’s a catch – this method only works when the paint is still wet. At this point, take a sponge, soap and water to the paint. After some serious scrubbing, you should be able to remove it in one job without damaging the car’s surface. Keep in mind that spray paint generally dries completely within 24 hours. After that, you’ll have to try another method. Also known as nail polish remover, acetone is an option once the spray paint has dried completely. Although this solvent seems fairly harmless and offers a quick and easy solution, there’s a small chance you’ll damage your car’s paint if you scrub too hard. As such, test a small area first and be sure to wash it off completely after the spray paint is removed. Lacquer thinner, a more powerful solvent, acts in much the same way but the chance of ruining your car’s paint is far greater. Used to dissolve resins on wood finishes, it removes spray paint in a similar manner. With this method, the key is starting small and going light. Use a clean cloth to rub the affected area and always have water on-hand if you notice it scraping away the vehicle’s paint job. Bought as a kit through an auto parts store, a clay and waxing combination is made to remove bonded contaminants, like spray paint, right from your car’s surface without scratching it. By moving the clay back and forth, the spray paint starts to come off. A rubbing compound works in a similar fashion. Starting with one small area, use a soft cloth or one with a lightly abrasive texture to rub the compound along the spray paint. In all cases, be sure to wax your car after to protect the surface. It sounds like a strange solution, but many DIY-ers swear by it for spray paint removal. Applying gasoline to a very small area quickly removes the spray paint, but there’s a serious risk: You might strip off the car’s clear coating in the process. Thus, don’t use this method over a large area and always have your car waxed afterwards. If the spray paint won’t come off, contact us today to set up an appointment. The technicians at DaSilva’s Auto Body will perform an auto painting job and exterior detailing, so the car looks good as new. How Can Pests Damage Your Car?